So apparently Leopard OS X can only connect to ancient Windows PCs that use CRTs when they’ve crashed (which is more than likely due to installing QuickTime). Real classy Steve. From the Wired Gadget Lab. Posted on October 27, 2007, in Uncategorized. Bookmark the permalink. 17 Comments. hah! I hadn\’t seen this…joke indeed. "Harmless jokes" don\’t belong in professional grade software unless they\’re well hidden (like the old ancient Microsoft easter eggs), not blatantly obvious to anyone. Wearing a hawaiian shirt under your clothes in a business meeting is one thing, but actually walking into the meeting in a hawaiian shirt is another. For instance, if it wasn\’t there as the default icon, but simply in there for to be selected, I really wouldn\’t care so much. Regardless, I expect more from a multi-billion dollar corporation. 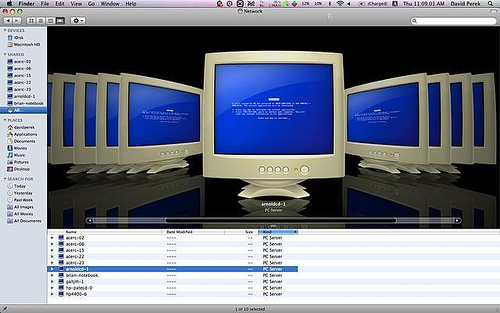 My configuration is: pavilion core 2 duo, 2gb, vista premium,,WLM 8.5. I\’ve error 80072ee7, of course I tried your suggest (all) in main page: http://messenger-support.spaces.live.com/ (/flusdns and all), my problem when inntall eset internet security. Now, is installed avast antivirus and windows firewall, but the error is same. Unfortuntatelly, I can\’t star webmessenger, too. conection troubleshoting show DNS and ports error, of course, repair button don\’t resolve.